No sooner did the BJP leaders of Gujarat announce the intention of changing the name of Ahmedabad to Karnavati just before Diwali, on November 7, 2018, many people’s mood changed from festivity to heated debate and furor across the state. For many of us, an online petition, initiated by Bandish Soparkar, on change.org protesting name change came to immediate rescue. Many chose to ignore the family reunion over Diwali and shared the petition online fervently through the night. In less than 24 hours, the signatories rose to seven thousand! In just three days the number of people registering their protest rose to over 15,000, keeping the auspicious Diwali celebrations on the side! There has been no looking back since, as social workers, architects, students, historians, common people continue to register their opposition and demand that Ahmedabad remain Ahmedabad. 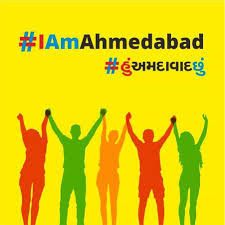 Soon, a group of over 250 young people started a Twitter protest with #IAmAhmedabad and a WhatsApp group, Save Heritage Ahmedabad. By then, media began to report the protests, some of the first being, The Wire, The Week and CounterView, and among the regional, Sandesh, Ahmedabad Mirror, Divya Bhaskar, etc. Not only did the newspapers report the protests accurately but also published opinion of eminent people against name change. Some of the newspapers took lead and began reporting the growing sentiment of the common people against name change and the difficulties people would face if the name of the city were to be changed. Importantly, many regional newspapers gave space to academic history of the city of Ahmedabad against rhetoric and majoritarian falsehood. This led to further awakening and soon individual protests and statements snowballed on social media. Those who found it easier registered their protest by posting individual voice and video recordings on Facebook and Twitter. Video of a small girl protesting against change of name became popular. Online voting exercise was started by different groups, and some of the early trends showed overwhelming support to not changing the name of the city. It was only when jokes on the proposition of name change began to make rounds that one knew that half the battle has been easy. 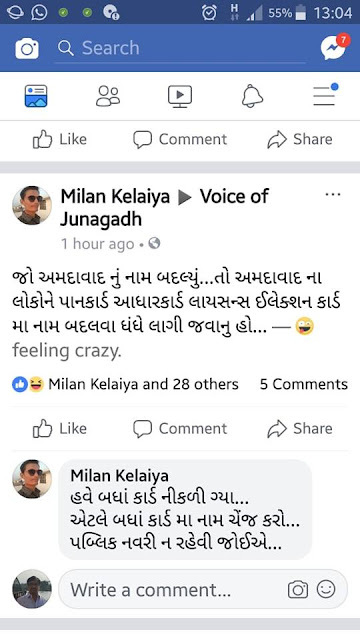 A Facebook post said, if at all the name of Ahmedabad is changed, people will be kept busy changing their Aaadhaar, election card, pancard, and so many other cards and documents. The intention of the government is to not let people be free at all, it added. Finally after six anxious days of tense campaign for many during otherwise fun Diwali days, when protests on social media turned humorous, many who had taken the lead on the first day after the announcement breathed a sigh of relief. Opposition to the changing of the name of Ahmedabad city is now catching up fast. 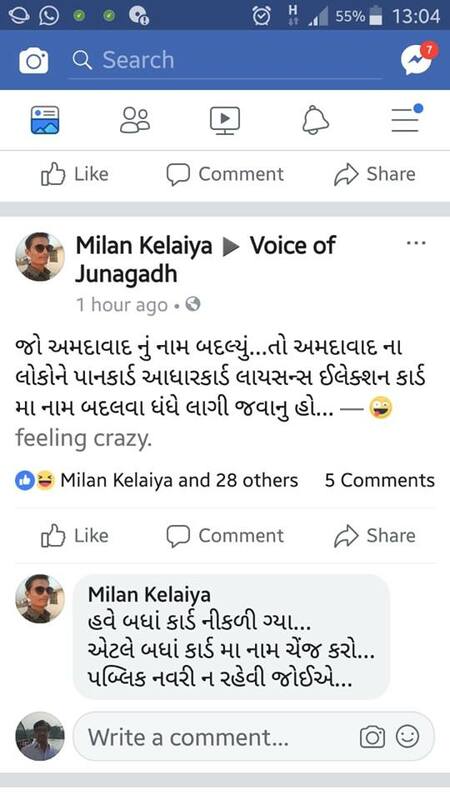 The news web portal Moje Gujarat shows how and why the people of Gujarat are angry against name change of India's first UNESCO heritage city and how BJP seems to be on the back foot. However, people are not taking things easy and protests against changing the name of Ahmedabad may take the scale of #VikasGandoThayoChe (development has gone mad) that one witnessed just before the 2017 state elections. The protest at that time in 2017 critiquing the Gujarat model of development had become so popular that the entire top level BJP team and machinery, including Prime Minister Narendra Modi had to campaign for state elections for several weeks leaving all other work on the side. And yet, the BJP came to power with much lower seat count in the state in 2017. No doubt, for BJP and right-wing Hindutva politicians changing the name of the city of Ahmedabad has been a long desire. Unfortunately for them, each time, the people of Ahmedabad and Gujarat have stood up and protested, and they have had to retreat. An interview with one of the most important public figures of Gujarat, late Girishbhai Patel, throws light on the earlier battle of the people of the state that thwarted the earlier attempt by BJP to change the name of Ahmedabad. To a Gujarati, Girishbhai needs no introduction. For others, Girishbhai was known as the PIL (Public Interest Litigation) man of Gujarat who had filed over 200 PILs for greater common good and for the underprivileged communities of the state. The interview of Girishbhai, taken by me in the years 2009 and 2017, is part of my forth coming book on peoples’ history of Gujarat. I reproduce some select excerpts from the interview here where Girishbhai talks about their struggle against naming Ahmedabad as Karnavati. "After forty five minutes of arguments in the court, the judge issued a notice. That notice proved to be a blessing because at that time a conflict had arisen between Chimanbhai Patel and Keshubhai Patel. 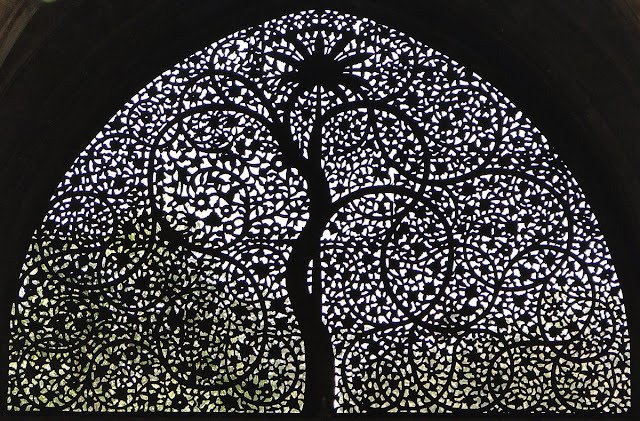 "The other important victory was concerning the changing of the name of the Ahmedabad city. Back then, they (BJP) tried to change the name of Ahmedabad to Karnavati twice. The Ahmedabad corporation mostly had members belonging to the BJP in those days. It was the VP Singh government at the centre I think. 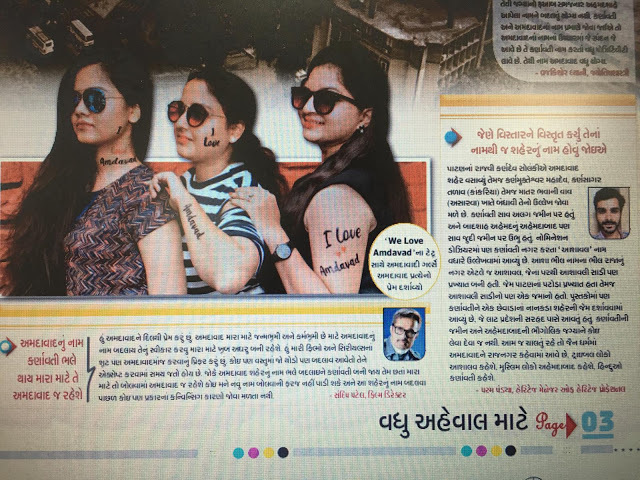 These people decided to change the name of Ahmedabad to Karnavati, as they did not want the history of Ahmed Shah to be reflected in the name of the city. The intention was to remove the name of a Muslim. Many of our friends came together. All our friends collectively worked hard and discovered/researched the history of the city. "We filed a petition in the High Court stating the procedure and the various steps that would have to be undertaken in order to change the name of the city. If the name is to be changed, there is so much to be done and so many procedures to be followed that it is not easy. Besides, the name would have to be changed at so many places including in the railway, post, etc, etc. The Ahmedabad High Court issued a notice and the matter was admitted. In those days, George Fernandes was in our favour. Discussions were held with George Fernandes about this matter and ultimately, the Central government did not give permission for the name change. That attempt was frustrated. Once again, the second time when the BJP Government was in power that a renewed attempt to change the name of Ahmedabad was made. Once again we fought and once again Fernandes came to our help. As reported in the newspaper "Sandesh" (October 14, 1998), a petition was filed by President, Council of Social Justice, Valjibhai Patel, Prof Nisar Ansari, Govindbhai Solanki, Anishaben Mirza and others challenging the resolution passed by the Ahmedabad Municipal Corporation on May 11, 1999 to change the name of Ahmedabad city. Advocates Girishbhai Patel, Harubhai Mehta and Ketan Dave represented the petitioners in the Gujarat High Court. Representing the state government, additional advocate general, SN Shelat, placed before the court a letter by the Home Ministry, Government of India, stating that there was no plan to change the name of the city. The court, taking on record the letter, dismissed the matter. 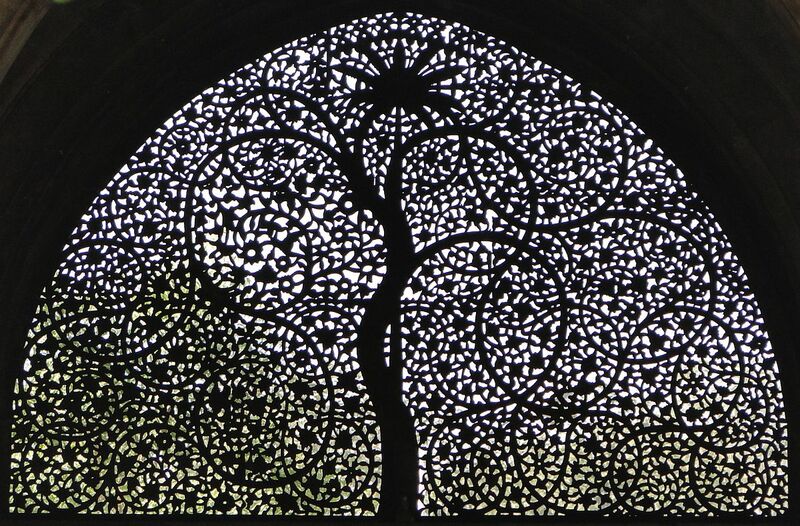 Thus, in the past also people of Gujarat have fought tooth and nail to retain the heritage and culture of Ahmedabad and its name against great odds -- fighting money and muscle power with sheer grit and determination. Today, once again people of the State fight with all their might against the unprecedented muscle, money and state power, not allowing the struggle of the previous generation go waste. Interestingly, the Prime Minister at that time was Atal Bihari Vajpayee (from March 19, 1998) and Home Minster was Lal Krishna Advani. While BJP may forget its NDA partners like George Fernandes and their legacy, the younger generation of Gujarat will fight to preserve the secular legacy of the State inherited from stalwarts like Girishbhai Patel and countless others.